We are pleased to offer our expert packing services, for whole homes, apartments, studies, college dorms and more. Precision Moving Company promotes recycling of used moving boxes. Upon request we will pick up used moving boxes after your move, FREE of charge. Simply empty and flatten your boxes and call to schedule a pickup. We offer this service not only for boxes purchased from Precision, but for all standard size moving boxes, including those purchased from other companies. We do require that the boxes be in dry, good usable condition. 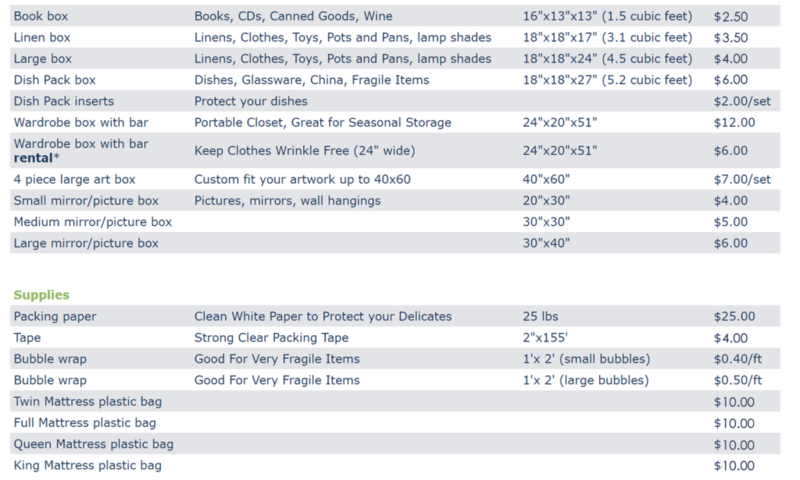 Standard sizes for moving boxes include the 1.5, 3.1 and 4.5 cubic feet boxes. Dish pack (5.2 cubic feet) and wardrobe boxes will also be accepted. We also require a minimum of 20 boxes for this service, within a 20 mile radius of our location in Somerville. Boxes that were purchased new from Precision Moving Company within the previous 6 months may be returned to our location in Somerville for a 25% refund of your purchase price. We require that these boxes please be empty, flattened and in good usable condition. Please call before coming to ensure that a representative of Precision is ready to accept your used boxes upon arrival. Used boxes are sold for 25% less than our new boxes. Quantities of used boxes vary. Please call for information on current supplies. To order used boxes call 617.623.7700 or e-mail us. We offer packaged packing deals based on the size of your moving space. Precision Moving Company sells new and used boxes for all of your moving needs. Reminder: used boxes are sold for 25% less than our new boxes. Small House (up to 1500 sq ft) Qty. Mid-Size House (1500-3000 sq ft) Qty. Large House (3000-4500 sq ft) Qty. Extra Large House (4500+ sq ft) Qty.